The perimeter walls of Erbil citadel viewed from below the ‘tell’. The buttresses give the impression of fortifications, but they support the exterior walls of houses built on the edge of the citadel mound. In October 2013, Richard Wilding was awarded an outreach grant by The British Institute for the Study of Iraq (Gertrude Bell Memorial) towards Erbil: Research, Interpretation and Conservation of the World’s Oldest City, his book with archeologist David Michelmore, advisor to the High Commission for Erbil Citadel Revitalisation. 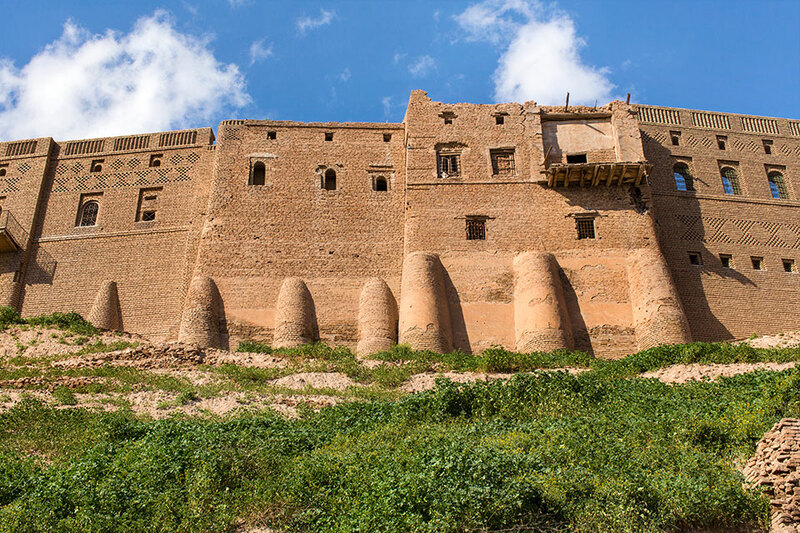 This article for BISI’s annual journal outlines his photography of the Erbil Citadel. In November 2013 I was awarded a BISI Outreach Grant in support of my photography of Erbil Citadel for a future joint publication with David Michelmore, Advisor on Conservation and Revitalisation to the High Commission for Erbil Citadel Revitalisation. I had visited Erbil in Spring 2013 when I travelled to Iraqi Kurdistan with Gulan, the UK charity established to document and promote the culture and heritage of Kurdistan. I was touched by the fragile beauty of Erbil’s citadel and impressed with the efforts being made to protect and restore it. With the aid of the BISI Outreach Grant I was able to return in Spring 2014 and photograph the citadel more extensively. Erbil citadel is dramatically situated on top of a mound, or ‘tell’, of accumulated archaeological layers, visually dominating the modern city of Erbil, which radiates out from below in concentric rings of expansion. The citadel therefore occupies an important position geographically and culturally, forming a magnificent backdrop to Erbil’s annual Newroz festivities in which the citizens join arm-in-arm to dance around its base. Believed to have been in existence for at least 6,000 years, Erbil correlates to ancient Arbela, an important Assyrian political and religious centre. The current buildings on the uppermost layer of the tell date back to the mid-18th century, the period when fortifications surrounding the town were replaced with houses. The urban fabric however reflects a much older pattern, as individual buildings have been levelled and rebuilt on the same site over successive eras, the process which also caused the tell to grow from the surrounding plain. The Sheikh Jamil Afandi house is a mansion from the late-Ottoman period. The large courtyard is surrounded on three sides by an arched portico supporting a roofed passage. The citadel mound is elliptical in shape and rises 25 – 32 metres above ground level. The town on top of the tell measures approximately 430 x 340 metres, with a labyrinth of streets and narrow alleyways radiating out from the main south gate. The approximately 100 houses that are built on the citadel perimeter form a continuous exterior wall, still giving the outward appearance of a fortress. The original inspiration behind my photography of Iraqi Kurdistan, and the Erbil citadel in particular, was the British photographer Anthony Kersting. In 2011, whilst undertaking research in the Conway Library at the Courtauld Institute of Art, in London, I came across a large number of prints and even more unprinted negatives of Iraq and the Kurdistan region taken by Kersting in the 1940s. A selection of these images were exhibited by Gulan in our exhibitions at the Royal Geographical Society in 2012 and 2013. The scenes that Kersting photographed in the Erbil Citadel would not have looked unfamiliar to a former inhabitant from the birth of urban civilisation thousands of years previously. Many of these streets and buildings are still recognisable today, but whilst in Kersting’s time the citadel was a busy, functioning town, it is now largely closed to the public. The number of inhabitants gradually declined during the 20th century as the city below grew, and the citadel became less compatible with modern life. 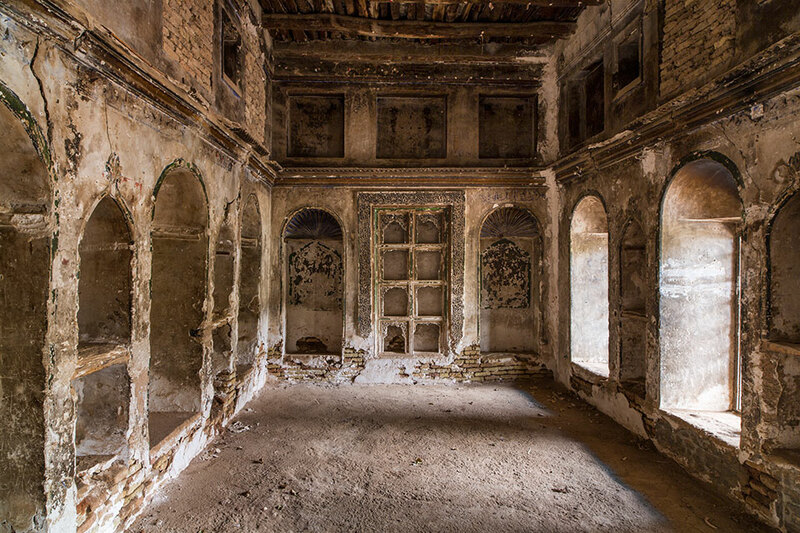 In the 80s and 90s, squatters driven out of their villages by the previous regime found refuge in the citadel and considerable damage was inflicted on the buildings. In 2007, the High Commission for Erbil Citadel Revitalisation (HCECR ) was established by the Kurdish Regional Government to protect and restore the citadel. The remaining 840 families were resettled, leaving just one family to hold on to Erbil’s claim of being the World’s oldest continuously inhabited city. Restoration work began in 2010, under the leadership of Dara Al Yaqoobi, head of the HCECR. 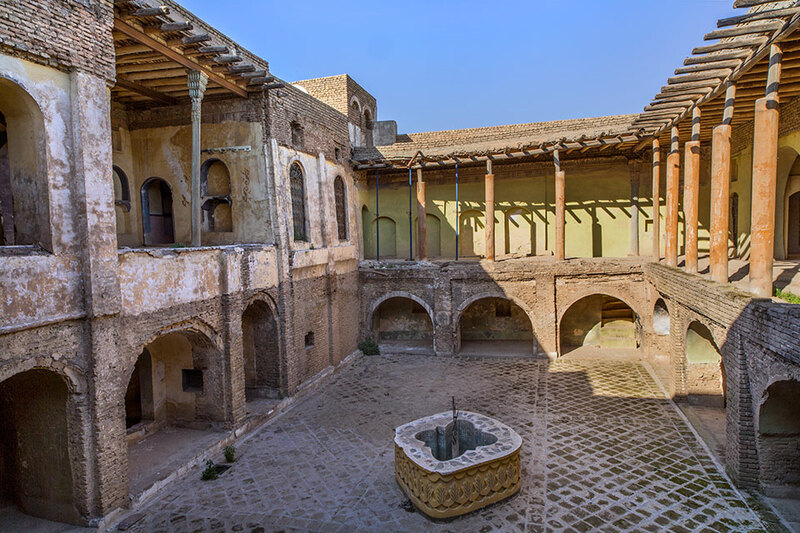 It is planned to re-establish the citadel as a centre for culture, tourism and recreation in the heart of modern Erbil. The late-Ottoman harem of Muhammed Karim Agha Asaadi incorporates a magnificent reception room with a panel of small niches in four tiers, surrounded by a richly moulded frame. The restored Hashim Chalabi house is occupied by the Kurdish Textile and Cultural Museum, founded in 2004 by Lolan Sipan. One of the few buildings in the citadel now open to the public, the museum displays a large number of carpets and other local crafts. In 2014 the incongruous and oppressive south gate, built in 1979 of concrete faced in brick, was replaced with a reconstruction of the Ottoman grand gate which had been demolished in 1958. The citadel was inscribed on the UNESCO World Heritage List in June 2014. For the past year, work on the citadel restoration has largely come to a halt due to logistical and budgetary constraints caused by the emergence in the region of ISIS during 2014. In February 2015 I gave a photographic presentation at Leighton House Museum, London on the fragile heritage of Iraqi Kurdistan and Saudi Arabia, and the conservation efforts being made in difficult circumstances. I included several photographs of the Erbil citadel, and also the related lower city in Erbil. Forthcoming lectures and exhibitions will also feature these images. In addition to BISI and Gulan, I would like to thank David Michelmore, Dara Al Yaqoobi, Ranan Khasraw Tawfiq and Dr John MacGinnis for their support and advice. 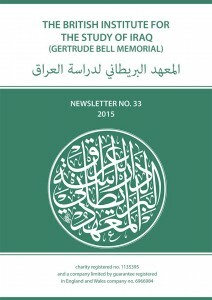 This article was published in The British Institute for the Study of Iraq’s 2015 newsletter. Richard Wilding is a London based producer and photographer working internationally with museums, governments and charities on cultural exhibitions, websites and publications. His work is largely focused on documenting the architecture, archaeology and costumes of the Middle East. A larger selection of Richard’s photographs of Erbil Citadel can also be seen within the Kurdistan section of this website. Richard is Creative Director of Gulan, a UK charity promoting the culture and heritage of Kurdistan.